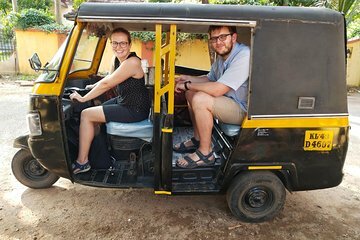 Benefíciese de la atención personalizada y de un itinerario totalmente personalizable en este tour privado de Kochi y Mattanchery en un tuk tuk (auto rickshaw). Recorra las calles como un local, escuche los comentarios sobre la historia y la cultura de Kochi con su conductor / guía. Visite los lugares destacados como las redes de pesca chinas, el palacio Cutch, el templo jainista y la iglesia de San Francisco. Recogida en el hotel y traslado incluido. Tour privado significa un itinerario personalizado y atención personalizada. Comentario informativo guiado sobre la historia y cultura de la ciudad. Biju picked me up promptly at my hotel. This was arranged through email and WhatsApp, so I knew when to expect him. The tuk tuk was clean and comfortable. Biju offered to tailor the experience to my preferences on what types of sites I wanted to see. He was very knowledgeable about Kochi and all of the sites. We stopped at temples, churches, a synagogue, and several markets. He also stopped to get me a refreshing lassi, and took me to an excellent restaurant for lunch before the tour was over. I highly recommend this tour as it was a great experience and very affordable. Our tuck tuk driver met us promptly at our hotel. We had a really excellent tour of Fort Kochi visiting all the important locations. Our driver/guide was very helpful and informative. We thoroughly recommend this tour-excellent value. -very nice tour-the driver was excellent and he explained everything very well. This was really fun excellent interactive tour of the area. Got out and saw lots of the highlights of the area. Some were docks, fishing area including the unique way they use nets to catch fish and we were allowed to participate, Jewish synagogue and Jewish area, temples, washing clothes area, spice and herb where train drops off and picks up after processed. We met woman working with ginger, candle making, teas and coffees, crafts and more. Guide was amazing. Gave a great history of the area and pointed out where Dubai docks were and how river is always being dredged. He even invited us into his home to have tea and bake goods with his with his beautiful wife and daughter, one of the best highlights. Great way to see Kochi. Drivers/guides were excellent! Very friendly, courteous, prompt, flexible and informative. Najeeb was great. He knew Fort Kochi inside and out. Took us to every destination within Fort Kochi we had asked for and more!!! We were treated to some Lassie and other indigenous food. Najeeb thoroughly explained the background and history of Fort Kochi. During his driving us around, he was concerned about our comfort and carefully avoided pot holes in the road. Definitely would enjoy another tour with Najeeb as our guide!!! Great tour, and the guide was a pleasure to be with very informative.